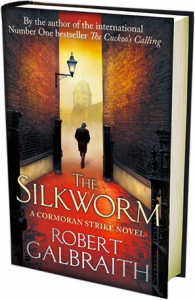 Here are many of the real-life locations featured in the pages of The Silkworm, the second book in the Cormoran Strike series. Click on each location for more info. The Albion – A pub in Hammersmith where Strike and Robin have lunch and talk about the case. Barons Court – Underground Tube station nearest Quine and Fancourt’s house on Talgarth Road. The Cambridge – A 19th century pub on Cambridge Circus where Strike and Robin celebrate his birthday. Charing Cross Road/Tottenham Court Road – Roads near Denmark Street. Chelsea Arts Club – Where Roper Chard hosts a party for one of their celebrated authors. Clement Attlee Court — The council housing where Kathryn Kent lives, which her home — Stafford Cripps House — is part of. Foyles – Where Robin buys an Owen Quine book. Fulham Palace Road – Where Elizabeth Tassel lives. The Groucho Club – The private club where Strike interviews Michael Fancourt. Hamleys Toy Shop – Where Strike buys gifts for his nephews and godson. Hazlitt Road – Where Jerry Waldegrave lives. The Kings Arms – The pub on Roupell St. where Strike and Matthew meet for the first time. King’s Cross Station – Where Robin catches the train north. Mango Tree – The Thai restaurant in Belgravia that Matthew name drops. Masham – The small market town in Yorkshire that Robin is from. Metro Cafe – A cafe next to Barons Court Tube station, where Strike grabs a couple of coffees. Pescatori – Where Strike has lunch with Liz Tassel. The River Cafe – The elegant restaurant where Strike meets his brother Al and does some investigation. Simpson’s-in-the-Strand – Where Strike interviews Jerry Waldegrave. Smithfield Cafe – Where Strike meets Dominic Culpepper early one morning. Talgarth Road – Where Quine and Fancourt’s house is located. The Tottenham Pub – Strike’s favorite local pub. Ye Olde Cheshire Cheese – Where Strike meets Nina Lascelles.